The HP CE261A Color LaserJet Cyan Print Cartridge, with a composite yield of 11,000 pages, offers great print quality and reliable performance for fast, professional quality color printing. Easy to install and replace, HP toner cartridges ensure output consistency over the life of the cartridge and make supplies easy to maintain by providing status monitoring and proactive alerts when replacement is needed. Designed together with your HP printer, these supplies ensure crisp, sharp, vibrant results every time. This cartridge has a composite yield of 11,000 pages. 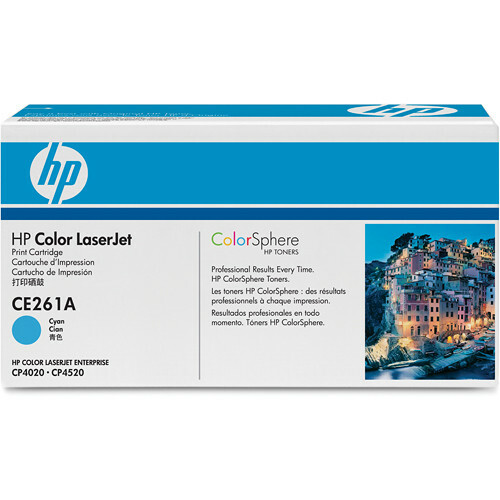 Box Dimensions (LxWxH) 15.5 x 8.3 x 6.4"
CE261A Color LaserJet Cyan Print Cartridge is rated 4.5 out of 5 by 2. Rated 4 out of 5 by Non-profit from Fast delivery Great price for new not remanufactured cartridges. Free shipping is very fast. Rated 5 out of 5 by Anonymous from I would buy this product again! Easy to install and does not produce smears or smudges.